I find the most time-efficient way to bake a sourdough loaf is to start on a weekend evening, finishing it off the following morning. This recipe makes one large loaf, which is enough to last my wife and me a week. We keep some fresh, slice up the rest and freeze it, ready to be thrown into the toaster when needed. 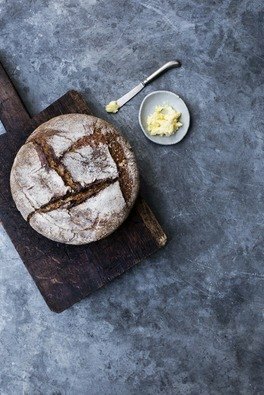 Bear in mind that if you opt for 100 per cent spelt flour, your loaves will not have the same dramatic oven spring as bread containing wheat flour, due to the lower quantities of gluten, which gives bread its structure. However, this does not affect the flavour, so if you are keen on a 100 per cent spelt flour bread don’t let this fact put you off. In a bowl, combine the water and the starter. Don’t worry if lumps remain in the starter – this is normal. In a second, larger bowl combine the flours and the salt. Add in the water and starter mixture and thoroughly mix together, ensuring there are no lumps of flour. Cover with cling film and leave at room temperature for 1 hour. With a very lightly floured hand, to prevent sticking, stretch and fold the dough. To do this, take a portion of the dough from the base of the bowl, stretch it up and over and press it into the opposite side of the dough. Repeat this movement 4 times, turning the bowl slightly in between each movement so you work your way around the entire dough – see photos 1 to 4, pages 28–29. Cover and leave to rest for 15 minutes. Repeat this process 3 more times, leaving 15 minutes in between each kneading. The whole process should take 1 hour, but only about 2 minutes of hands-on time. Once you have finished, cover the bowl and leave it out at room temperature overnight (or for at least 8–10 hours). If you live in a very warm climate, place the bowl in the fridge overnight. The following morning the dough should have doubled in size and feel light and airy to the touch. If you refrigerated the dough, remove it and leave it to prove at room temperature for a few hours until it has doubled in size. Liberally dust your proving basket or bowl lined with a clean tea towel with rice flour. Make sure it is well coated, otherwise your sourdough will stick when you turn it out into your baking vessel. (If you are following these steps for the porridge sourdough or rye & maple sourdough, scatter the oats or rye flakes in a thin layer on the base of your proving basket.) Set it aside. Lightly dust the work surface with rice flour, and gently tip the dough out on to it. Use a spatula to help coax all the dough out, and take care not to knock out too much air. The dough will be very soft and a little sticky. With floured hands, take 1 edge of the dough and pull it up and out, then back over itself into the centre of the dough. Work your way around the dough, repeating this movement as you go, each time pulling the edge of the dough out and then back in over itself so that the floured edges are now all puckered together in the centre, and the bottom surface of the dough is fully coated in the rice flour, see step photos 5 and 6 on page 28. The dough should feel a bit tighter at this point. Flip the dough over so the puckered surface is facing down. Cup your hands around the ball of dough and bring them together underneath the dough, gently pulling the surface of the dough downwards – see photos 7 and 8 on page 29. Rotate a little and repeat this movement all the way around the dough until the surface feels smooth and tight. Transfer it into your proving basket with the smooth rice flour covered surface facing down and the puckered surface facing up in the centre. Dust with more rice flour, cover loosely with a tea towel and leave to rise in a warm spot for 1½ –2½ hours depending on the temperature of your kitchen, until the dough has noticeably risen, but not doubled in size. Thirty minutes before the final rise is complete, put your cast-iron or heavy-based pot and lid into the oven and preheat to 240°C/220°C fan/Gas mark 9. When the final rise is completed, carefully remove the pot from the oven and gently, with the support of your hands so it does not lose its shape, invert the dough out of the basket and into the pot, so the puckered centre is now facing the bottom and the smooth surface (or oat/rye covered surface) is facing up. Take extreme care throughout this process, as the pot will be burning hot. With a small, very sharp knife or blade, cut 2 to 4 shallow slashes into the surface of the dough, to allow the bread to expand during baking. Put the lid on the pot and place it in the oven. Immediately turn the temperature down to 220°C/200°C fan/Gas mark 7. Bake the bread for 30 minutes, then remove the lid and bake for another 10–15 minutes, until the crust is deeply golden brown, just a few shades shy of being burnt. This is important for both texture and flavour. To check the bread is cooked through, tap the base. It should sound hollow. If not, bake for another few minutes and test again. Once cooked, leave to cool on a wire rack. Do resist the temptation to dive in while it is still hot, as this will release all the internal steam and affect the quality of the crumb. Once it is cool enough to handle, but still warm enough to melt butter, you can go ahead and slice off a chunk of your well-earned sourdough.